Matilda and Melissa have their cute lambs. I have a tree. We’re adding a leaf per person per day if we’re good little boys and girls (and the term is loosely applied). Note that brown paint, folks. We had no brown paint, but I made do with purple and yellow. I suppose I do have a crafty trick or two up my sleeve when necessary. 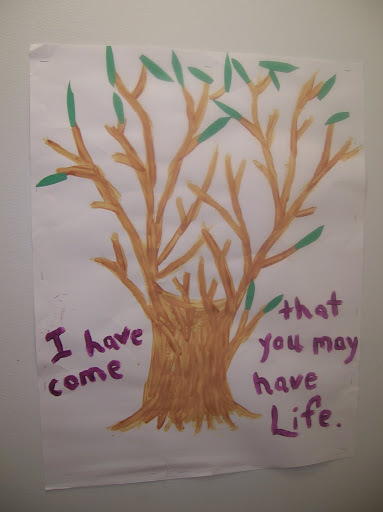 I got the tree idea from The Forty Days of Lent from the Celebrating the Faith in the Home series. I love these books. I own them all and have gifted them out. If you need a resource with good ideas for making the Church seasons real for yourself and your children including the research as to why we Catholics do the things we do, these are the books for you. I’ve a lot of thoughts in my head this Lent, and I’m trying to sort these ideas out. Such heavy concepts and I feel like there is an elusive lightbulb moment. I read a bit here or a bit there and they all seem interconnected, but I’m not getting it. Yet. Four years ago, I took a blank book and labeled it the Reitemeyer Family Prayer Journal. We began listing things for which we were thankful and things for which we were praying. We did it for three whole days. But I kept the book, and have decided to use it for my Lenten reflections. Maybe in a few weeks some of these random thoughts will make more sense. I hope. In thanksgiving for…fond and selective memories.